Disused Railway Stations | Mickle Trafford & District Villages website. Notes: Mickle Trafford (BJR) station opened on the Birkenhead Joint railway’s Chester to Warrington line in 1889 only a stones throw from the CLC station of the same name. The station was a relatively simple wooden affair. The CLC Chester Northgate to Manchester Central line ran extremely close to the BJR at this point but up until 1942 there was no connection between them. 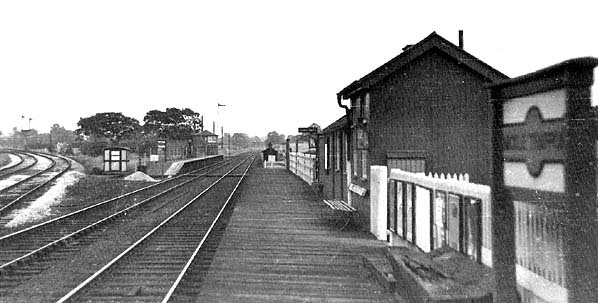 At that time a south to north junction was put in and this required the relocation of the Chester Platform further to the south west. This produced a staggered platform station. Being in quite a sparsely populated area the station was an early closure in 1951. Interestingly a number of other ‘country’ stations closed on this otherwise extremely busy line in the early 1950’s. Interestingly the site of the station was to undergo further developments after its closure. In 1969 to facilitate the closure of Chester Northgate the Junction between the CLC and the BJR was reversed so that CLC line trains could join the BJR and enter Chester by that route. This new junction obliterated the site of the Chester platform. At a later date this junction was altered to create a Scissor Junction allowing trains to access both lines from both directions, although by this time only goods services traversed the former CLC in the Chester direction. In the early 1990’s the junction was altered again as the CLC route to Chester and on to Sealand closed for good. 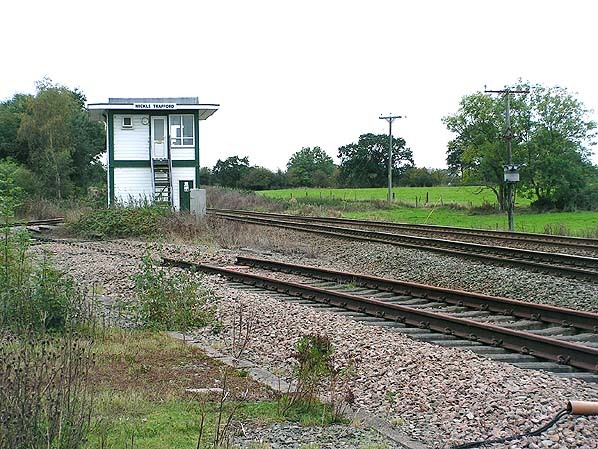 Today the site is still the junction for CLC and BJR passenger services and it is controlled by Mickle Trafford Signalbox. Today no trace of the station remains but the line is still a busy route between North Wales and Manchester via Warrington and Chester and Manchester via Northwich. The site of Mickle Trafford Station looking southwest on 14.10.2005.. In the foreground is the disused former junction to the CLC heading towards Chester, this was the later scissor crossing but it would have been on the site of the earlier wartime connection between the CLC and BJR. Behind the signalbox can be seen the CLC line which joins the BJR on the other side of the signalbox, at the point where the relocated Chester platform would have stood.